Phog Lounge has been trying to encourage customers, community members, artists, and more to become involved in the improvement of their city. This pertains to all levels of life such as the block you live or work on, your neighbourhood, or your ward. A FREE opportunity to see how Pittsburgh changed itself through business and community involvement is coming on Friday, February 26th. Writer/producer/director of My Tale of Two Cities, Carl Kurlander, will be on site for the showing of the film at The Capitol Theatre. 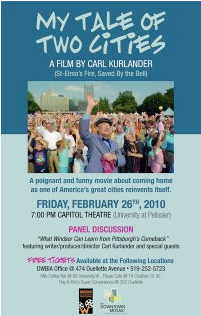 Panel discussion afterwards “What Windsor Can Learn from Pittsburgh’s Comeback” featuring writer/producer/director Carl Kurlander and special guests. Coffee Exchange – 266 Ouellette Ave.
Ray & Kim’s Super Convenience – 353 Ouellette Ave. This entry was posted in Uncategorized and tagged capitol theatre, Carl Kurlander, chris edwards, dwbia, film, my tale of two cities. Bookmark the permalink.